Thursday 3 December 2015 saw the official opening of the Kentekenloket. The festivities were held at a branch of Euromaster in south-east Amsterdam. This location was specifically chosen to highlight the expertise offered by this new initiative. Private parties can now use the Kentekenloket based at 500 car companies to transfer their car registration while also taking advantage of the expertise on hand. Frank Doorenbos, commercial director of the initiator Brezan Automaterialen, had the honour of opening the morning, after which Rolf Lauret, president director of Autobinck Group, explained why it is both logical and important that Kentekenloket is taking on PostNL for the right to register vehicle transfers. “These days, it is up to consumers to decide where they want to do business. 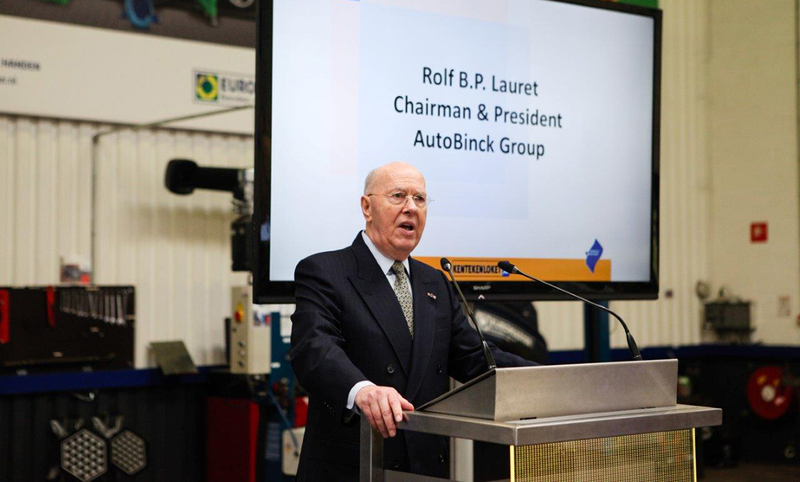 So what could be more logical than a car company providing an even wide range of services?”, Mr Lauret asked the people present at the opening. It should not come as a surprise that it was Brezan that instigated the Kentekenloket. The company already supplies everything for the automotive industry. Feasibility studies were unanimous: a car company is the most logical place for the formalities involved in transferring vehicle registration. “This was an important motive for establishing such a major and entirely new concept in the automotive industry. PostNL has had a monopoly in this area for decades, so it’s high time we have a good, logical alternative,” says Rolf Lauret. The same rules apply to transferring vehicle registration at a Kentekenloket as at a post office. This decision was made by the National Vehicle and Driving Licence Registration Authority (RDW). The vendor needs the vehicle registration document and the registration code. The buyer must be at least 18 years old and have a Dutch identity document. The new registration card is then sent to the buyer by the RDW. People buying a private car can now go to one of 500 RDW-recognised car companies to transfer vehicle registration. For extra peace of mind, they can also arrange for a pre-purchase inspection or a free odometer reading check. You will find more information about the Kentekenloket on www.kentekenloket.nl.